Axonal excitability techniques provide a powerful tool to examine pathophysiology and biophysical changes that precede irreversible degenerative events. This manuscript demonstrates the use of these techniques on the ulnar nerve of anesthetized rats. Wild, B. M., Morris, R., Moldovan, M., Krarup, C., Krishnan, A. V., Arnold, R. In Vivo Electrophysiological Measurement of the Rat Ulnar Nerve with Axonal Excitability Testing. J. Vis. Exp. (132), e56102, doi:10.3791/56102 (2018). Electrophysiology enables the objective assessment of peripheral nerve function in vivo. Traditional nerve conduction measures such as amplitude and latency detect chronic axon loss and demyelination, respectively. Axonal excitability techniques "by threshold tracking" expand upon these measures by providing information regarding the activity of ion channels, pumps and exchangers that relate to acute function and may precede degenerative events. As such, the use of axonal excitability in animal models of neurological disorders may provide a useful in vivo measure to assess novel therapeutic interventions. Here we describe an experimental setup for multiple measures of motor axonal excitability techniques in the rat ulnar nerve. The animals are anesthetized with isoflurane and carefully monitored to ensure constant and adequate depth of anesthesia. Body temperature, respiration rate, heart rate and saturation of oxygen in the blood are continuously monitored. Axonal excitability studies are performed using percutaneous stimulation of the ulnar nerve and recording from the hypothenar muscles of the forelimb paw. With correct electrode placement, a clear compound muscle action potential that increases in amplitude with increasing stimulus intensity is recorded. An automated program is then utilized to deliver a series of electrical pulses which generate 5 specific excitability measures in the following sequence: stimulus response behavior, strength duration time constant, threshold electrotonus, current-threshold relationship and the recovery cycle. Data presented here indicate that these measures are repeatable and show similarity between left and right ulnar nerves when assessed on the same day. A limitation of these techniques in this setting is the effect of dose and time under anesthesia. Careful monitoring and recording of these variables should be undertaken for consideration at the time of analysis. The use of electrophysiological techniques is an essential tool for the in vivo investigation of peripheral nerve function in neurological disorders. Conventional nerve conduction methods utilize supramaximal stimuli to record motor action potential amplitude and latency. These techniques therefore provide useful information on the number of conducting fibers and on the conduction velocity of the fastest fibers. A valuable complementary tool is that of axonal excitability testing. This technique uses sophisticated electrophysiological stimulation patterns to indirectly assess the biophysical properties of peripheral nerves, such as the activity of ion channels, energy-dependent pumps, ion exchange processes and membrane potential1. Axonal excitability testing is commonly utilized in the clinical setting to investigate pathophysiological processes and effects of therapeutic interventions on various neurological disorders. Importantly, axonal excitability measures are sensitive to therapeutic interventions that affect peripheral nerve function such as intravenous immunoglobulin (IVIg) therapy2, chemotherapy3 and calcineurin inhibitor (CNI) treatment4. Although these studies have provided important insights, clinical studies often preclude investigation of early disease traits and novel therapeutic options5. Therefore, the use of these methods in animal models of neurological disorders has recently gained traction6,7,8,9. Indeed, these methods provide an opportunity to understand the specific nerve excitability changes associated with these disorders, thus advancing translational research. The procedure described here is a simple and reliable method to record axonal excitability measures on the ulnar nerves of the intact rat. All experimental procedures described here complied with the Animal Care and Ethics Committee of UNSW Sydney and were performed in accordance with the National Health and Medical Research Council (NHMRC) of Australia regulations for animal experimentation. NOTE: 12 week old, female Long-Evans rats were used in this procedure. Anesthetize the rat in an induction chamber using 4% isoflurane and 1 L per min O2 flow rate. Confirm sufficient anesthesia by testing for the righting reflex and ensure its absence before removing the animal from the induction chamber. Note that various anesthetic agents have differential effects on nerve excitability10. Securely place the animal's snout in the nose cone attachment and deliver a maintenance dose of 2.5% isoflurane and 1 L per min O2 flow rate. Confirm adequate anesthesia by checking for both pedal withdrawal and corneal reflexes by pinching the animal's toes and gently touching its eye. NOTE: Application of vet ointment on eyes, to prevent dryness while under anesthesia, is recommended but not essential as the procedure typically takes 30 min per animal. Maintain the body temperature of the rat at 37 °C with the use of a feedback controlled heating mat and a rectal thermometer probe. Set the heating mat and integrated body temperature sensor to 40 °C to prevent any skin damage that occurs with higher temperatures. NOTE: It is recommended to monitor and record physiological measures (heart rate, oxygen saturation, body temperature and respiratory rate) every 10s with the use of an animal physiological monitoring system. Optimal recording procedures should include local measurement of the limb temperature as the peripheral temperature can be colder than that of the core temperature11 (Figure 1). Wear antiseptic gloves and always use instruments that have been cleaned with 70% ethanol, to maintain a pathogen-free environment throughout the procedure. Use low impedance platinum electroencephalogram (EEG) needle electrodes for this procedure. Prepare the recording needle electrodes by inserting the recording needle electrode (Figure 1; indicated in purple) through the hypothenar muscle and the reference electrode through the dorsal aspect of the 4th digit (Figure 1; indicated in orange) to record compound muscle action potentials (CMAPs). Place the ground electrode through the skin on the superior aspect of the forearm between stimulating and recording electrodes (Figure 1; indicated in green). Take care when inserting the electrodes to avoid muscle tissue. Prepare the percutaneous stimulating needle electrodes by inserting the cathode (Figure 1; labelled in blue) approximately 4 mm distal to the cubital tunnel at the elbow. Insert the anode (Figure 1; labelled in red) approximately 1 cm proximally through the skin of the axillar region. Figure 1: A schematic diagram of the needle electrode placements in the rat forelimb. The cathode (blue) is inserted approximately 4 mm distal to the cubital tunnel at the elbow and the anode (red) is inserted approximately 1 cm proximally through the skin of the axillar region. The ground needle electrode (green) is inserted through the skin on the superior aspect of the forearm between stimulating and recording electrodes. The recording (purple) and reference (orange) needle electrodes are inserted through the hypothenar muscle and through the dorsal aspect of the 4th digit. The temperature probe (grey) is placed on the superior aspect of the thenar muscle. Please click here to view a larger version of this figure. Perform the rodent motor nerve TRONDNF protocol using a semi-automated, computer controlled axonal excitability program (see the Table of Materials) linked to a constant current stimulator and an amplifier. Remove excess 50 Hz electrical noise using a 50/60 Hz noise eliminator. Record the CMAP from the hypothenar muscle by simultaneously visualizing the CMAP morphology and applying a 1 ms square-wave pulse to the ulnar nerve with the cathode needle electrode. To achieve optimal recordings, carefully adjust the angle and/or position of the cathode until an optimal biphasic response curve with constant amplitude is achieved (Figure 2A.). Once the optimal position has been determined, stabilize the cathode with a repositionable electrode holder. NOTE: The software used automatically delivers the test stimuli, described below, and increases or decreases the current required to achieve the threshold. Record a stimulus-response curve by incrementally increasing the stimulus intensity of a 1 ms impulse by 1 mA until a maximum response is achieved. NOTE: The purple and green line in figure 2B and 2C represents the incremental increase of the stimulus intensity and the automated system respectively. The target amplitude for threshold tracking is automatically set to 40% of the maximal amplitude corresponding to the area of the steepest slope on the stimulus-response curve. The change in 'threshold' (i.e. stimulus required to elicit 40% CMAP) induced by various test stimuli is the variable of obtained throughout the remainder of the protocol. Record multiple axonal excitability parameters, including threshold electrotonus (TE), current-threshold (I/V) relationship and recovery cycle (RC) as described in reference12. NOTE: The computer controlled axonal excitability program assesses the threshold (TE) with a 100 ms subthreshold depolarizing and hyperpolarizing currents that is set at ±20% and ±40% of the control threshold current. The change in threshold after both depolarizing and hyperpolarizing currents is automatically recorded at 14 time-points during the 100 ms polarizing current and 12 points after the polarizing current. Threshold electrotonus indirectly assesses the internodal conductances and is a marker of membrane potential. The I/V relationship is assessed with 200 ms subthreshold conditioning currents that alternate in intensity from +50% to -100% of the control threshold in 10% increments. The I/V relationship differs to TE in that the currents are longer in duration, the intensity of polarization is progressively altered from +50% to -100% and the threshold change is assessed at each intensity 1 ms after the polarizing current has ceased. The I/V relationship provides insight into the rectifying properties of the axon1. The RC is assessed with a paired pulse paradigm, where an initial supramaximal conditioning stimulus is applied followed by a series of test stimuli at specific intervals from 2.5 ms to 200 ms. This parameter tests a well-defined series of events that occur in the nodal region of the axon following supramaximal stimulation. These events include, the inactivation of voltage-gated Na+ channels which makes it more difficult to elicit a subsequent response and is quantified by refractoriness and the relative refractory period 1. This is followed by a charging of the internode and a period of heightened excitability mediated by fast potassium channels, quantified by superexcitability. Finally, slowly activating potassium channels mediate a late period of reduced excitability, quantified as subexcitability. Figure 2: Raw data from an axonal excitability test. Panel A demonstrates abiphasic CMAP response curve after incremental increase of stimulation to the ulnar nerve. Panels B and C represent the stimulus intensity (mA) and amplitude of CMAP (mV), respectively. The green component of B and C depicts the automated incremental decrease in stimulus intensity and the associated sigmoid shaped decrease in CMAP required for threshold tracking. Transfer the rat to a separate cage until it has regained sufficient consciousness to maintain sternal recumbency. Do not leave an animal unattended and in company of other animals until it has fully recovered from the anesthesia. Once the rat has fully recovered from the anesthesia, transfer it back into its original cage. At completion of the study, euthanize the rat without pain for the animal, e.g. lethal intraperitoneal injection of a barbiturate (e.g. lethabarb). Electrophysiological measures of the rat ulnar nerve were obtained with the present protocol. 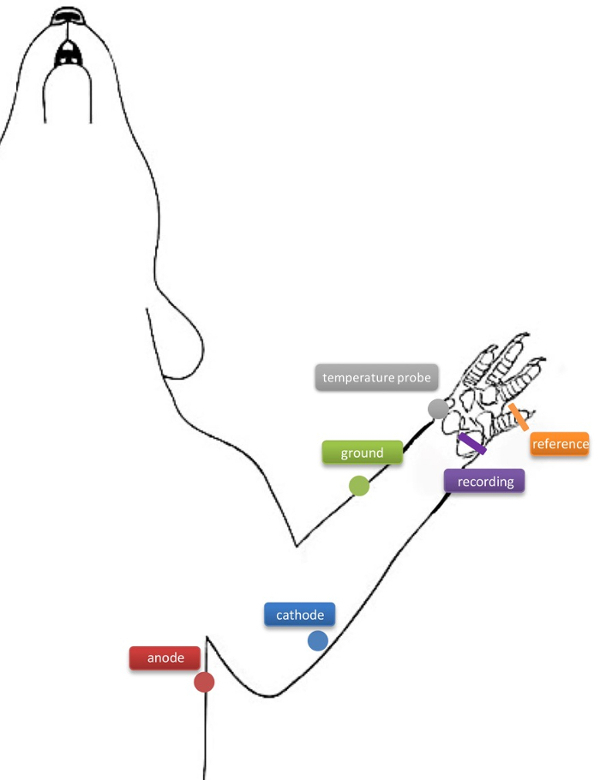 Figure 3 demonstrates a representative recording from the left ulnar nerve of a 12 week-old female Long Evans rat. Compound muscle action potential relates to the number of conducting fibers that are simultaneously activated. The supramaximal peak response (mV) (Figure 3A) demonstrates the peak response achieved when incrementally increasing the stimulus until the there is no change in the response (Figure 2B). Figure 3B represents the current-voltage (I/V) relationship produced by currents longer in duration (200 ms) and their intensities changed in 10% increments from +50% to -100% of the threshold. The I/V relationship assesses inward and outward rectification by examining differences in threshold current in response to depolarizing and hyperpolarizing currents. The bottom left quadrant reflects inward rectification accommodating to hyperpolarization and activation of inwardly rectifying conductances1. The upper right quadrant reflects fast and slow K+ channel activation and the outward rectification accommodating to the depolarizing current. Internodal conductances can be examined using threshold electrotonus waveform (Figure 3C) in response to long subthreshold depolarizing and hyperpolarizing currents. Both hyperpolarizing and depolarizing TE have variables that can be calculated by averaging the threshold change between specific time points 10-20 ms, 20-40 ms and 90-100 ms.
Changes over time due to injury or the application of therapeutic interventions may cause specific changes to nerve excitability parameters. This may provide useful in vivo information regarding pathophysiological changes, early disease traits and therapeutic efficacy in animal models of neurological disorders. Figure 3: A representative axonal excitability plot. (A) Stimulus-response curve depicting the supermaximal peak response (mV). (B) The current-voltage (I/V) relationship produced by a 200ms polarizing stimulus ranging from +50% to -100% of the threshold current. (C) Threshold electrotonus illustrating waveforms in response to prolonged subthreshold polarizing current elicited by a 20% and 40% depolarizing (above 0 on y axis) and hyperpolarizing (below 0 on the y axis) current. Please click here to view a larger version of this figure. Sequential axonal excitability testing was undertaken on the left then right forelimb of n=4 rats (12 week-old). Both left and right recordings were completed within 35 min after the loss of the pedal withdrawal reflex. The analysis was performed using the paired non-parametric Wilcoxon signed rank test. These analyses revealed no significant differences between left and right ulnar nerves for any of the axonal excitability variables. Consistency was demonstrated in standard nerve conduction parameters, CMAP amplitude and latency (Figure 4A and B) as well as nerve excitability variables including superexcitability and threshold electrotonus hyperpolarizing (TEh) 90-100 (Figure 4C and D). However, previous studies10 have indicated significant change over time in parameters does occur under isoflurane anesthesia (see discussion). Figure 4: Mean recordings (n=4) obtained for (A) peak response (B) latency (C) superexcitability and (D) hyperpolarizing threshold electrotonus (90-100ms) in both left (red) and right (blue) ulnar nerves. The error bars indicate the standard error of the mean (SEM). Please click here to view a larger version of this figure. The described procedure demonstrates a simple and reliable, minimally-invasive technique that allows assessment of the biophysical properties and membrane potential of the axon in a short period of time. Compared with other more invasive techniques, which require the exposure of the nerve, the present method of axonal excitability testing induces minimal tissue damage thus enabling in vivo assessment that preserves the physiological conditions of the nerve of interest and allows for repeated measurements. To ensure consistent results there are a few methodological considerations that need to be addressed. One such factor is the concentration and type of anesthetic. It has been previously demonstrated that isoflurane has an effect on hyperpolarization-activated cyclic nucleotide-gated channels10. Alternatively, an injectable anesthetic mixture of medetomidine, midazolam and butorphanol was investigated and also demonstrated effects on nerve excitability over time10. Medetomidine/midazolam/fentanyl (MMF) appears to have little effect on nerve excitability and has been successfully used in many nerve excitability studies7,13,14, though its effects over time on nerve excitability have not been systematically investigated. Of note, this anesthetic is difficult to obtain in the US and Australia as fentanyl is a controlled substance with strict import regulations. Regardless of chosen anesthesia, dosage and time under anesthesia should be carefully monitored for consideration at analysis. Another factor to consider is electrode quality. Due to the strong and prolonged hyperpolarizing and depolarizing currents applied in axonal excitability studies high quality electrodes are required. In this study, low impedance platinum electroencephalogram (EEG) needle electrodes were used. Low impedance electrodes are typically within the kilo-ohms range and the platinum EEG electrodes conventionally operate within the 0.5 - 5 kilo-ohm range which qualifies as low impedance electrodes. The axonal excitability program can record the current output and calculate impedance versus the target out voltage and it has been previously established that the current was stable for 30 min, which is the typical length of this protocol15. Additionally, these electrodes have been recently introduced in mice16 and were found to not be subject to polarizing effects14,15. Therefore, polarization would not be a problem during the experimental procedure. In contrast to protocols that expose the nerve of interest, these studies utilize an intact model which makes positioning of stimulating electrodes approximate. Thus, exact replication of electrode placement in longitudinal studies may be difficult. Despite this, a previous study with different anesthesia demonstrated good repeatability of 30/34 ulnar nerve excitability parameters across 3 separate studies similar to that seen in tibial and caudal nerves13. Furthermore, in this study, comparison of right and left CMAPs showed consistency (Figure 4), suggesting precise and proper electrode placement is sufficient to offset this possible limitation. There are several critical steps in the process of acquiring CMAP responses. Proper and consistent placement of the stimulating needle electrode is crucial for the reproducible measurements of the amplitude. Additionally, it is essential to ensure proper placement of recording needle electrodes to minimize background noise. Therefore, simultaneously visualizing the response curve while placing the stimulating needle electrode is crucial to confirm consistent placement. Krishnan, A. V., Lin, C. S. -Y., Park, S. B., Kiernan, M. C. Axonal ion channels from bench to bedside: a translational neuroscience perspective. Prog neurobiol. 89, (3), 288-313 (2009). Lin, C. S. -Y., Krishnan, A. V., Park, S. B., Kiernan, M. C. Modulatory effects on axonal function after intravenous immunoglobulin therapy in chronic inflammatory demyelinating polyneuropathy. Arch neurol. 68, (7), 862-869 (2011). Park, S. B., Goldstein, D., Lin, C. S. -Y., Krishnan, A. V., Friedlander, M. L., Kiernan, M. C. Acute abnormalities of sensory nerve function associated with oxaliplatin-induced neurotoxicity. J. Clin. Oncol. 27, (8), 1243-1249 (2009). Arnold, R., Pussell, B. A., Pianta, T. J., Lin, C. S. -Y., Kiernan, M. C., Krishnan, A. V. Association between calcineurin inhibitor treatment and peripheral nerve dysfunction in renal transplant recipients. Am. J. Transplant. 13, (9), 2426-2432 (2013). 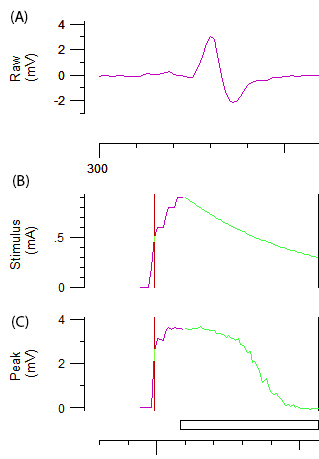 Boërio, D., Greensmith, L., Bostock, H. Excitability properties of motor axons in the maturing mouse. J. Peripher. Nerv. Syst. 14, (1), 45-53 (2009). Boërio, D., Kalmar, B., Greensmith, L., Bostock, H. Excitability properties of mouse motor axons in the mutant SOD1(G93A) model of amyotrophic lateral sclerosis. Muscle & Nerve. 41, (6), 774-784 (2010). Alvarez, S., Calin, A., Graffmo, K. S., Moldovan, M., Krarup, C. Peripheral motor axons of SOD1(G127X) mutant mice are susceptible to activity-dependent degeneration. Neurosci. 241, 239-249 (2013). Fledrich, R., et al. Soluble neuregulin-1 modulates disease pathogenesis in rodent models of Charcot-Marie-Tooth disease 1A. Nat. Med. 20, (9), 1055-1061 (2014). Vianello, S., et al. Low doses of arginine butyrate derivatives improve dystrophic phenotype and restore membrane integrity in DMD models. FASEB J. 28, (6), 2603-2619 (2014). Osaki, Y., et al. Effects of anesthetic agents on in vivo axonal HCN current in normal mice. Clin Neurophysiol. 126, (10), 2033-2039 (2015). Biessels, G. J., et al. Phenotyping animal models of diabetic neuropathy: a consensus statement of the diabetic neuropathy study group of the EASD (Neurodiab). J. Peripher. Nerv. Syst. 19, (2), 77-87 (2014). Boërio, D., Greensmith, L., Bostock, H. A model of mouse motor nerve excitability and the effects of polarizing currents. J. Peripher. Nerv. Syst. 16, (4), 322-333 (2011). Arnold, R., Moldovan, M., Rosberg, M. R., Krishnan, A. V., Morris, R., Krarup, C. Nerve excitability in the rat forelimb: a technique to improve translational utility. J. Neurosci. Methods. 275, 19-24 (2017). Moldovan, M., Alvarez, S., Krarup, C. Motor axon excitability during Wallerian degeneration. Brain. 132, (Pt 2), 511-523 (2009). Madison, R. D., Robinson, G. A., Krarup, C., Moldovan, M., Li, Q., Wilson, W. A. In vitro electrophoresis and in vivo electrophysiology of peripheral nerve using DC field stimulation. J. Neurosci. Methods. 225, 90-96 (2014). Moldovan, M., Krarup, C. Evaluation of Na+/K+ pump function following repetitive activity in mouse peripheral nerve. J. Neurosci. Methods. 155, (2), 161-171 (2006).